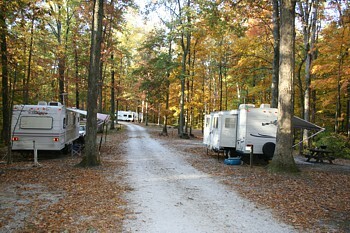 Muscatatuck Park offers 50 campsites. Full hook up:	Muscatatuck offers 8 sewer sites that are also pull-thru sites. Electric sites have 30 and 20 amp service. Water is available at each site. Sewer sites are in an open field that gets good satellite reception. Electric and Water:	Campground has 26 sites that have both water and electric. All sites include a picnic table and fire ring. These sites are under a shady forest canopy. The sites have 30 and 20 amp service. Graveled pull-thrus are also available for non-sewer sites. Dump station is located near campground entrance. Tent Sites:	Campground hosts 15 marked primitive sites. Each site has a picnic table and fire ring and extra space for extra tents. All sites have access to modern bathroom/shower facilities during the "camping season". Primitive bathrooms are available in the winter. Group camping is also available. Water is off in the campground and camp shower house November 1st till approximately April 1st. Water is available year round in the beginning of the campground. Note: "Walk-ins" or "Drive-ins" (people who do not pre-reserve) will not receive the above discounted pricing. "Walk-in" pricing is posted in displays cases in campground and by the bathhouse. *The park has limited the length of a visit to two weeks, except for a potential five customers. Individuals wanting to stay for over two weeks must contact the Visitor Center and sign a usage agreement that insures that you help keep our campgrounds clean and aesthetic for all our customers.